For Narendra Modi and the BJP, the loss in these three states is not a chronicle foretold, but a lesson in disguise. 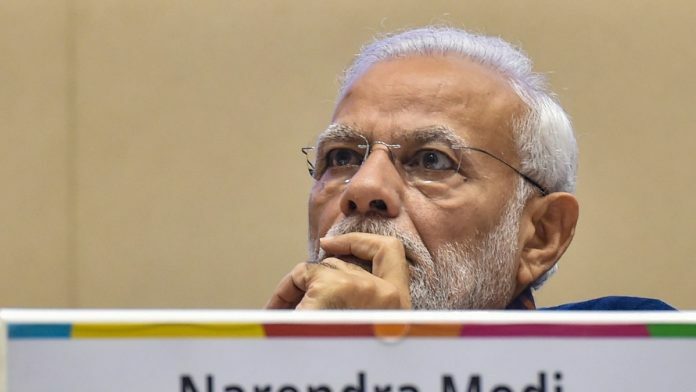 A full 72 hours have elapsed since the BJP’s defeat in Chhattisgarh, Madhya Pradesh and Rajasthan, but apart from his initial comments about accepting “the people’s mandate with humility,” Prime Minister Narendra Modi hasn’t said a word. For a leader who has made his mark in national and international politics with his aggressive eloquence, Modi’s silence is most unusual. It is not reticence because that is not the PM’s nature; if anything, he likes to lead from the front, a commander who certainly enjoys a good fight. It is not ill-health because since 11 December the PM has spoken at a variety of occasions. He has addressed an international conference on Ayushman Bharat, pointing out that there must be a two-pronged strategy on healthcare. He said as many as 150,000 wellness centres, which will include a component of yoga, will be started by 2022 – an ambitious target the PM believes the next government, whichever it is, must pursue. Note the PM’s supreme self-confidence. In Argentina at the G-20 meeting in late November-early December, he invited all the leaders of the G-20 – ranging from the presidents of the US and Russia to the Chancellor of Germany and the prime minister of Argentina – to have their meeting in India in 2022. He was demonstrating to the world he intends to win again in 2019. On 12 December, he wished young Arunima Sinha the best as she embarked on an expedition to Antarctica; on 13 December, the PM tweeted birthday wishes to some party colleagues – science and technology minister Harsh Vardhan and Goa chief minister Manohar Parrikar. So when he met all the BJP MPs at a parliamentary party meeting at the start of the winter session in Parliament Thursday, he didn’t say one word. There was absolutely nothing on why the BJP lost these state polls, nor an exhortation that all will soon be well and the party will fight hard to regain the people’s confidence. Tributes on the passing away of former prime minister Atal Bihari Vajpayee were read at the parliamentary party meeting, after which it was quickly wound up. The PM maintained a stony silence. Perhaps Narendra Modi, the master strategist, is sensing a change in the mood, the only one to grasp the first straws of a possible reversal of the breeze flowing across the North Indian plains. Of course, all the usual disclaimers apply. State poll results cannot be projected onto a general election canvas. The PM remains hugely popular, personally. And the BJP is never going to give up power without a fight – moreover, the RSS’ stakes are already too high. The national and international media have, almost universally, spoken about the need for balance in the BJP. The NDA allies have condemned the arrogance in the coalition’s largest party and, most importantly, welcomed the end of fear. After the BJP’s defeat in the elections in three crucial states, Akali Dal MP Naresh Gujral told ThePrint, “The general fear in large classes of the people, especially the minorities, stands extinguished”. The BJP sources believe that the RSS will apply a corrective in their own way. They say no heads will roll because Modi cannot be seen to be publicly accepting blame so close to the eve of the polls. Amit Shah is also expected to continue to lead party strategy, although he has been notably absent from the TV screens these last few days. “Amit bhai has won us 19 elections. Can we discount that?” a senior BJP leader told ThePrint. The PM has a model before him, if he wants to reverse the tide – in any case, neither in Madhya Pradesh nor in Rajasthan has the Congress won so convincingly that the BJP cannot take strong corrective measures and regain the people’s confidence – which is Arvind Kejriwal’s Aam Aadmi Party. In 2015, the key to AAP victory in Delhi was the groundwork that Kejriwal & Co had laid in Delhi, going from house to house with folded hands and asking for forgiveness – for throwing away the vote, which the people had given him only the year before, after only 49 days in government. If Modi travels across the country and says sorry, he can undoubtedly win back his primary place in people’s hearts. That place remains. It hasn’t – yet – paved the way for Rahul Gandhi. For Modi and the BJP, the loss in these three states is not a chronicle foretold, but a lesson in disguise. If they don’t learn from it, the Congress party is waiting in the wings. Rahul Gandhi knows that he cannot afford to make another mistake, after these “semi-final” victories. Silence is golden. Perhaps the PM follows this dictum. Perhaps there is a sense of disbelief. Perhaps the reasons have not been analysed. Perhaps he feels that by remaining silent he implies that these elections are not important in the context of 2019. But one undeniable fact is it has stung, and stung hard. Expect the BJP to come all guns blazing in the days to come. The attacks on the family will sharpen and be relentless. He visits Rae Bareli tomorrow and is unlikely to make the visit an ordinary one. The return of Nirav Modi and Méhul Choksi would be facilitated in the next two months leading up to the election. Every issue that Congress tomtoms will likely be blunted. Expect the BJP to corner the Congress on its poll promise of farm loan waiver, something that is bound to fail given the financial position of the states and the sheer amount of waiver. Hence, this silence is dangerous. The author is a really good script writer. Why in the world would beloved Prime Minister ask forgiveness for ushering a stable governance never seen before in 70 years of independent India. Perhaps the lutyens media including the author can rejoice all they want on the recent elections, but even a dumb person wouldn’t call the election result as a victory for the Nehruvian Gandhi family or the opposition. All the opposition can accomplish after a series of electoral losses never seen before across the country is a wafer thin victory after 15 years of BJP government beating anti incumbency in Madhya Pradesh, hard fought victory in Rajasthan and a comprehensive victory in Chattisgarh, rout in Telengana. Your victory is too short enjoy it while it lasts, as 2019 elections prospects for BJP and PM Narendra Modi is very bright. On other issues one cannot say, but a heartfelt Sorry was called for after demonetisation. Forget the rich, whether they keep their money in mattresses or in Switzerland. The poor got washed over by a tsunami of misery and dispossession. The slightly more than a hundred people who visibly perished, standing in queues outside banks, were a tiny tip of the iceberg of those whom this thoughtless move actually killed. I would see the smug spokespersons on TV, not a simple word of sympathy. The most well informed spokesperson is now our central banker.